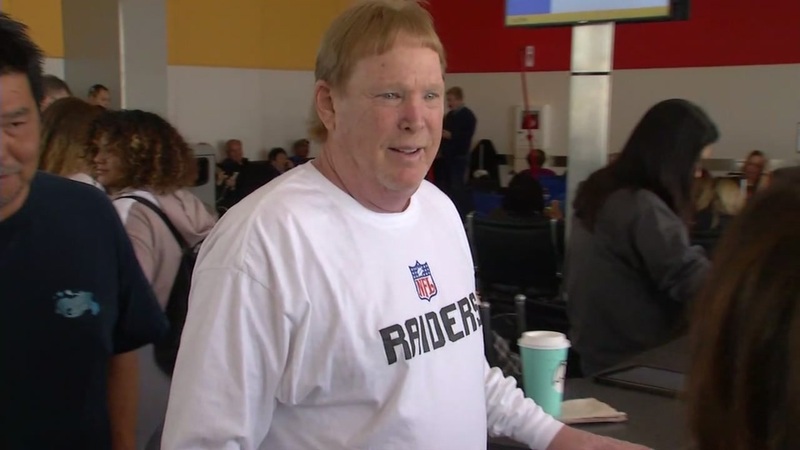 OAKLAND, Calif. (KGO) -- A new report seems to confirm that Raiders owner Mark Davis had his sights set on moving to Las Vegas sooner than he let on publicly. According to ESPN Davis told a top league executive over dinner in July of 2014, "I'm going to Vegas, baby." The article confirms that Davis met with Vegas casino magnate Sheldon Adelson in January of 2016, weeks before he made a public pledge to keep the team in Oakland. "My heart is here, and if we can get something done, that's what I'm trying to do," Davis said. The revelation of Davis' 2014 statement and his purchase of the lasvegasraiders.com domain name in 1998 raise the question as to just how committed he was to staying in Oakland, which could prove problematic legally for the Raiders. NFL relocation rules state teams must make a good faith effort to stay in their own market. Oakland is mulling its legal options regarding the Raiders move. Click here for more stories, video, and photos on the Oakland Raiders.